Bodegas Leza Garcia is a family-owned winery in Uruñuela in the Rioja Highlands (Rioja Alta) region of Spain on the south bank of the river Ebro. 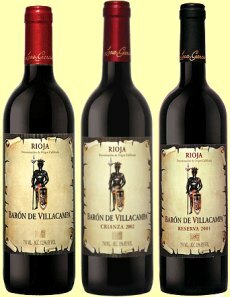 They produce various different labels, including this small portfolio of Riojas under the Barón de Villacampa brand. Rioja was awarded ‘DOC’ classification (Denominación de Origen Calificada) in 1991, and remained the only Spanish region to enjoy this superior appellation until Priorat was elevated from DO too, in 2000. Tempranillo is the major grape of Rioja and of this producer, and the Tempranillo cuvée is released young in a fresh, approachable style and, unusually for a red Rioja, spends no time in wood. The Crianza is aged for a minimum of 12 months in American and French oak, whilst the range-topping Reserva is aged for 24 months in French and American oak. Availability of the wines is currently quite limited, but they are stocked in the Royal Lyceum Theatre and Cornelius Beer & Wine in Edinburgh. Scottish importer is Harris Fine Wine.